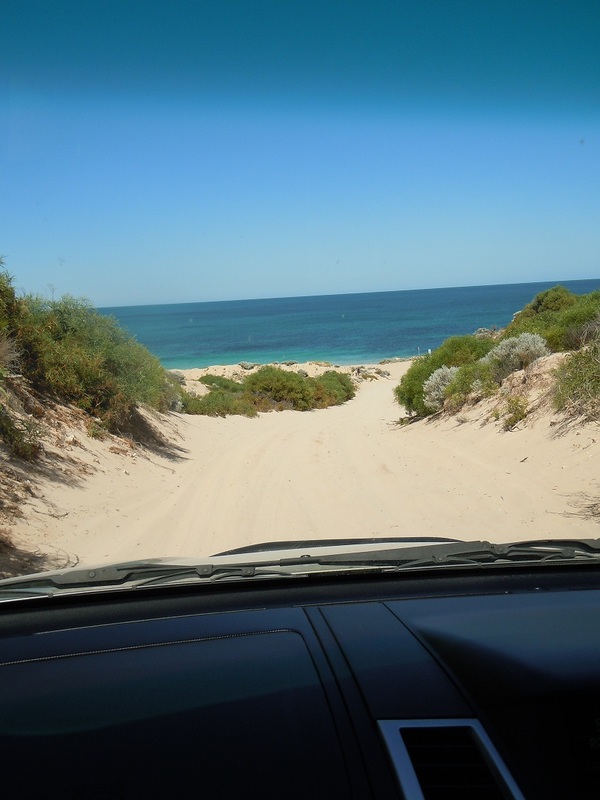 The Southern Shores 4wd trip is a well known track along the beach south of Mandurah in Western Australia. 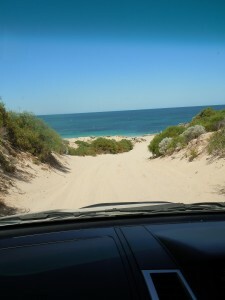 The 4wd trip starts at the end of White Hill Road and continues southward towards Bunbury. 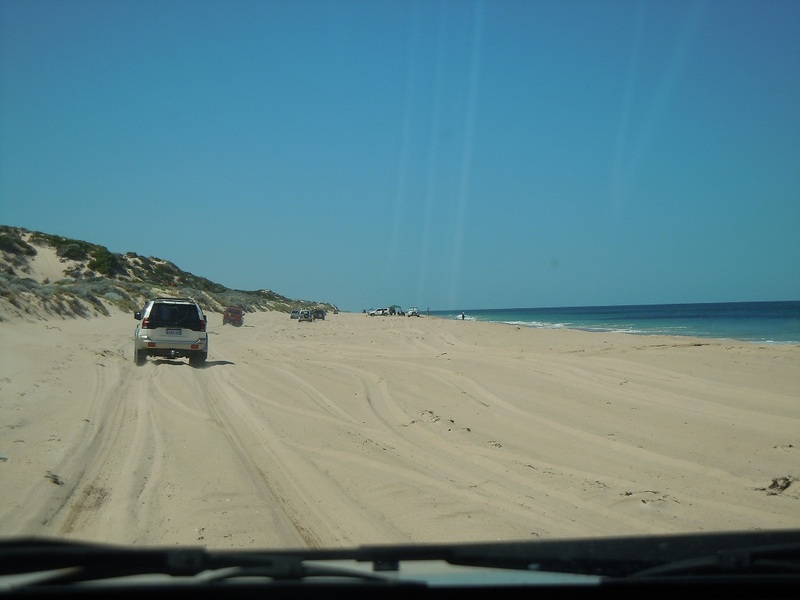 There are exit points at Preston Beach and Myalup as you head south. The conditions vary widely from still and perfect to rough, windy and very soft. 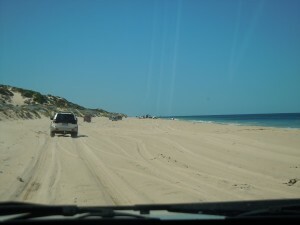 It is a very popular place for beach go-ers, fishermen, picnic-ers and four wheel drivers. 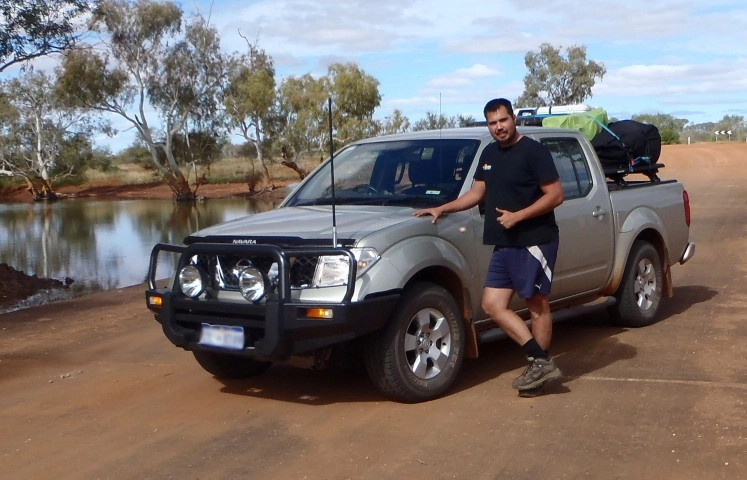 We were lucky enough to be able to do this 4wd trip with a local 4wd club as visitors (prior to becoming members of the club). The support and assistance that the members of the club offered us made the trip very enjoyable. As one of our first four wheel drive trips, it was a great experience. Enough to challenge us while being easy enough so that we didn’t have too much trouble… With the driving, at least. To start the trip, we were scheduled to meet at the Miami Plaza shopping centre at 9am. Driving in with our almost stock standard 2010 Mitsubishi PB Challenger and seeing a line-up of fully modified and built-up Landcruisers and Patrols made us feel a little out of place. The amazing welcome that we received from the club members quickly changed that. After a quick briefing, we headed south, across the Dawsville Channel towards Lake Clifton, eventually turning right onto White Hill Road. White Hill Road quickly turned into a moderately corrugated hard sand road. Part way along, we stopped and reduced pressure in our tyres. To get onto the beach at the end of White Hill Road, we had to drive down into a dune swale, and then up a large dune and over to the beach. Occasionally this dune is very soft and can be tricky to climb. The day we were there the track was hard and it was a simple drive and descent down the other side. Take a look at 4wd Tips and Tricks – Sand Driving if you’re interested. The day was absolutely perfect. A gentle easterly blowing, flat crystal clear turquoise water, dolphins playing in the shallows. The sand was soft enough in places to make it interesting, but not so soft that it was difficult driving. Although we were told that the beach is a very variable place and can be windy, rough and very very soft. 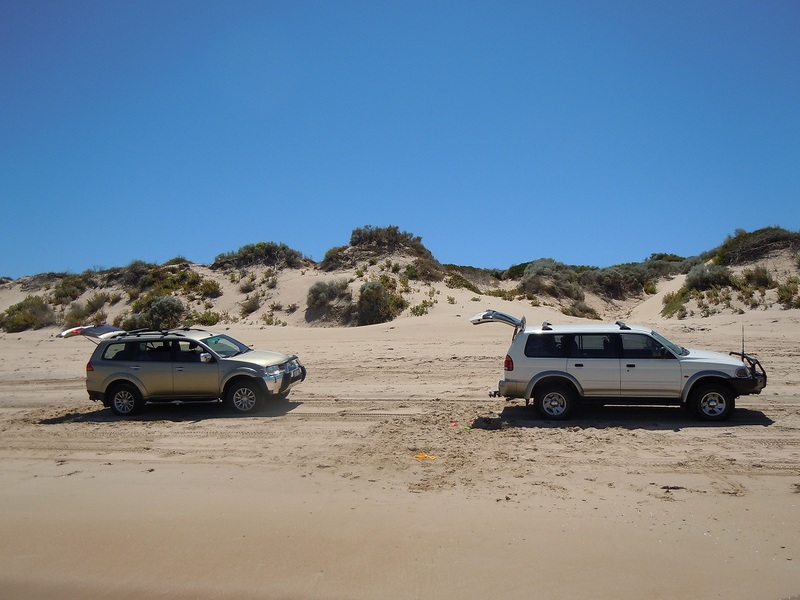 We followed the convoy and gradually became used to driving on the sand. We passed many other vehicles who were there for a picnic, fishing or just a day out driving on the sand. Part way along to Preston Beach, we stopped for morning tea and a swim. On such a hot day, it was fantastic to plunge into the beautiful water. 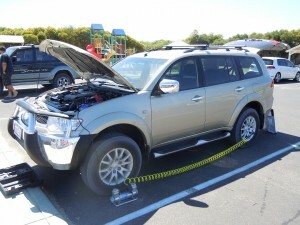 Eventually, we arrived at Preston Beach and pulled into the car park for a pit-stop. We quickly got on the radio and said “Well that’d be us then. I guess we should pull over and check it out”. Everyone was very keen to help out. We looked under the car and could see some kind of redish fluid dripping from the bash plates. My first though was engine coolant, but when I touched it it was oily feeling. As luck would have it, the Triton behind us in the convoy had experienced exactly the same issue on a previous trip. At his suggestion, we opened up the bonnet and checked the power steering fluid. It was almost completely empty. Looking into the engine bay from the top, he pointed out where the power steering fluid pipes joined into the steering mechanism. It was quite obvious that one of the pipes was not tightened as much as the other. I dug a hole under the front of the vehicle so that I could slide underneath and removed the bash plates. From there, I was then able to reach in and access the pipe attachments. The one that looked lose was only finger tight. A quick couple of turns with a spanner fixed that. One of the advantages of travelling with a convoy of serious 4×4 owners is that if you don’t have the part you need yourself, then there is a pretty good chance that someone else will have it. A quick call over the UHF radio and a bottle of power steering fluid was on it’s way. A quick re-fill and we were back on our way. After our introduction to beach mechanics, the convoy headed off once more. For a couple of cars it was a little touch and go taking off again. There was some bogging, but nothing that the vehicle couldn’t get themselves out of. No problem for the Challenger though. We’d already had our share of toruble for the day. We continued on south towards Myalup. As lunchtime approached, the trip leader started looking out for places to stop and eat. A place wide enough to accommodate the vehicles, and also allow other beach go’ers to pass us by. We eventually stopped and set up the beach shelters and had a great picnic on the sand, and then another swim. There is no keeping our son out of the water. Not ever the huge stingray that swam past just behind a number of club members who were still in the water. After lunch, we all turned around and headed back to Preston Beach, rather than continue on to Myalup. Back at Preston Beach, we all re-inflated our tyres with our compressors and headed off. After the 4wd trip on the beach, a number of us headed off for a wine tasting at Vineyard 28. 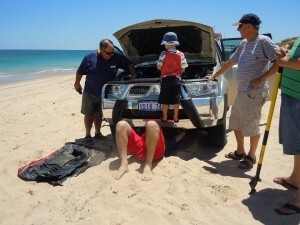 Sitting under the shade cloth with Jasper the Red Cloud Kelpy, the 4wd club members and the owner was great. Very relaxing. Fantastic wines. The perfect end to the day. where is the beach on the homepage. Looks nice for fishing. You mean the background pic? That’s on the south coast of WA, just south of Pemberton. Cross the Yeagarup dunes and through the bush tracks. It’s a great place for fishing! 4wd access only as well. But having said that, it’s very popular so you definitely won’t be the only one on the beach. Anyone can access the beach down there. You don’t need to be a club member. I’d strongly recommend not going by yourself though just in case you get into trouble. Usually there are people around to help you out but it’s best to be self sufficient if you can. And also make sure you’re doing it safely. There are often a lot of kids and dogs running around so just keep an eye out and keep the speed down as much as possible.